Twenty-one year old Sabu is no stranger to life’s challenges. 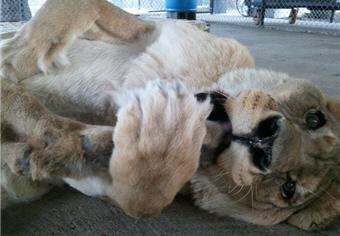 Sabu and several other animals were adopted by a Nevada wild animal facility to save them from being destroyed. The privately owned non-profit organization eventually decided that it would be in the best interest of the animals to relocate Sabu, the other big cats and wolves to another facility that might be better equipped to take care of large carnivores. So in March 2005, the animals relocated to the Wild Animal Orphanage (WAO). Due to financial mismanagement, the WAO filed for bankruptcy and closed its doors in 2010, leaving roughly 400 animals (including exotic cats, bears, wolves, and primates) essentially homeless. We previously adopted Jynxie, a lioness who also came from the WAO in the fall of 2010, and had no intentions of accepting another lion from the same facility until we learned Sabu was the last lion living at the WAO and that his chances of finding a new home was slim to none due to his physical impairments and advanced age. Sabu had also been neutered thus leaving him maneless but still very handsome. The decision was easy—Sabu needed us and so we took him in. A bound and determined Sabu made the 250+ mile trip from San Antonio to Wylie Texas in May 2011. When Sabu walked into his new home, we immediately noticed that he had a problem remaining on his feet and walking straight. Often times, animals displaying this type of health problems are euthanized. However, we recognized immediately what was wrong with Sabu. Our veterinarian placed him on a special diet, medication and prescribed lots of Vitamin A. 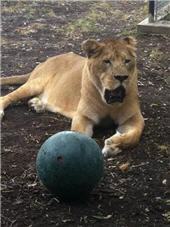 Today, Sabu not only walks with a slight swagger, but he can also run and play with his favorite enrichment balls! We never gave up on Sabu, despite all the nay-sayers who told us that Sabu would never enjoy a healthy quality of life again! We are hopeful that with a lot of love, compassion, medical treatment, and a healthy environment, Sabu would not only walk again, but he would run!